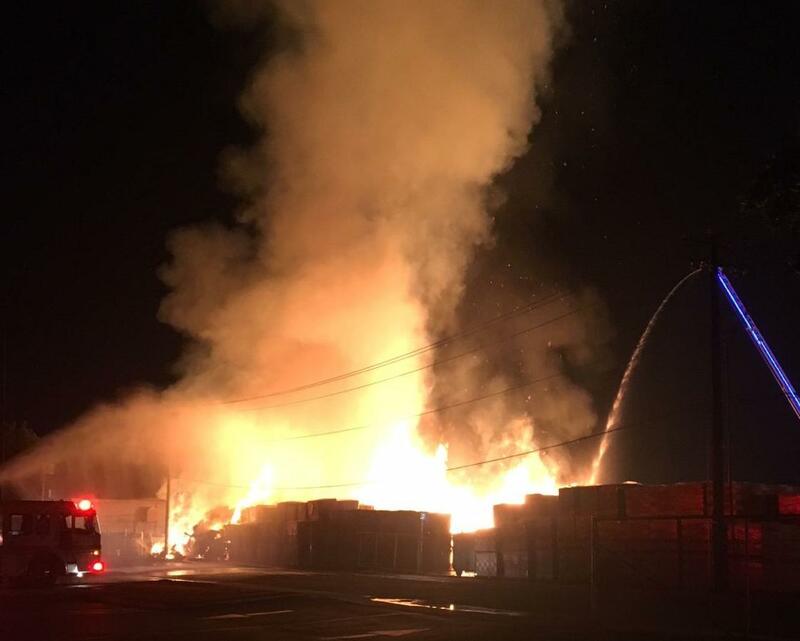 YAKIMA, Wash. – The Yakima Fire Department finished mopping up hot spots at Fruit Packers Supply Inc. on Sunday, where the day before a fast-moving fire destroyed two steel buildings, a pair of semi-trucks and multiple stacks of cardboard packing material and boxes. The fire, which officials suspect was a case of arson, caused an estimated $20 million in damage. It was the second fire at the company in a 48-hour window. Both fires are under investigation by the federal Bureau of Alcohol, Tobacco, Firearms and Explosives. Shift Commander Tom Schneider said the fire department left the scene Sunday morning. On Sunday afternoon, most of 16th Avenue from River Road to Fruitvale Boulevard – which was closed for the better part of Saturday – was back open. The fire was first reported at 1:48 a.m. Saturday, and knocked out power to more than 1,000 homes and businesses. Pacific Power’s website showed power had been restored by Sunday afternoon. Saturday’s fire resulted in firefighters from a dozen departments or districts being called in to control the blaze, some from as far away as the Lower Valley and Kittitas County. The fire took nearly eight hours to contain. The first fire at the company started early Thursday morning and caused $1 million in damage. A company official said the fire, while devastating, will not shut down operations. Employees are expected to resume work Monday. Published: Aug. 13, 2018, 9:30 a.m.